The Withings Home is exactly what it claims to be - a complete home monitoring solution. Like all things, the Withings Home has its flaws but they are outweighed considerably by its strengths. The beautiful design, great app functionality, plethora of features including zoom, plus its good performance make the Withings Home the smart home camera to beat. Withings is better known for its health monitoring devices, but activity trackers and smart scales aren't the only pies it has its fingers in. The Withings Home is an HD camera with air quality sensors that allow you to monitor your home using an accompanying smartphone app. It joins a plethora of other smart cameras already available on the market but, in true Withings style, it adds good design to the party. It isn't just about looks, though, as the Withings Home has plenty of features up its sleeve too, but with a plethora cheaper competition biting at its heels, does it do enough to warrant the £170 price tag? The Withings Home is a lovely looking device and one that we were happy to have on display in our house. Its cylindrical shape, 75mm diameter and 87mm height don't make it the smallest smarthome camera around, but it's designed to fit any home environment by becoming part of the decor. The 5-megapixel CMOS sensor on board looks through a wide-angle lens, situated in a black oval front and centre of the device, with an ambient light sensor above it and an IR LED below it for night vision. This oval is surrounded by a real, natural wood housing that wraps around the entire circumference of the white plastic body, leaving just an inch exposed at the bottom complete with Withings logo. You don't get candles with brand logos sprawled across them so chances are you wouldn't want a heavily branded smart camera either. The wood case twists clockwise or anticlockwise, allowing you to cover over the lens, locking into place with a click when in the correct position. When the cover is open the design reminds us a little of a wooden version of a Minion (from the movie Despicable Me), albeit minus the yellow colour - although we would like to see a few more colour options introduced, bright yellow might be a step too far. On the rear of the Withings Home you'll find three connection ports comprised Micro-USB power, Ethernet and a USB 2.0 socket, alongside two environment sensors. You don't have to use the wired Ethernet port, though, as the Home can connects wirelessly to a network via Wi-Fi too. Of course having a power port means you'll have a lead running to the nearest plug socket, which you have to take into consideration because of the way it will look. However, the included white lead is certainly preferable to the black one featured on the BT Smart Home Cam 100. If you look closely, you'll notice a couple of small microphone holes on either side of the Home between the white base - which also acts as a multi-coloured night light - that enable the Home to detect noise. For sound output, there's a 2W speaker to the top which sits flush with the wood finish and, slightly below it, there is a Volatile Organic Compound (VOC) sensor for detecting the air quality. The device itself sits on a white magnetised disc, as shown in the lead image, meaning everything is held in place securely, gripping to whatever surface you place it on. Withings is no stranger to making beautiful devices and the Home is no exception. It's weighty at 226g, which adds to the feeling of quality, and we love how every aspect has been considered. Attention to detail is the Withings Home's best attribute as every element has a function to play with nothing added for the sake of it. It's a great looking smart camera and it certainly beats its competitors in this department. As with all Withings products, setup is achieved via the accompanying iOS app - note it's Apple only, with no Android or other platform support for now - which makes it straightforward. Plugging the Home into the power but not switching it on is the first step and then it's simply a case of following the app's instructions. The app searches for your device, allowing you to select like you would a Wi-Fi network, and it then configures the Withings Home. After the configuration, any software updates are downloaded and setup is finalised. We had a few issues to begin with, both with the initial connection and the language staying as French rather than English even after we changed it, but that's probably down to turning the power supply on before the app told us to. If there are any issues, the night light alerts you using a series of colours, which is helpful. A blue light pulsing means the Withings Home is waiting for a Bluetooth connection, while an orange pulsing light means it can't establish a connection. If there's a green light then you have successfully setup the Withings Home, while a red light means you have failed. Being able to unlock the Withings Home with Apple Touch ID is a huge bonus for security and is much quicker than typing in a password - but this can be turned off if you'd rather go for the traditional PIN method. The Withings Home is packed to its wooden brim with features from streaming HD video at 30 frames per second (including a video feed), to allowing you to have a real-time conversation with your cat while you're not home. It is a comprehensive home monitoring solution, just like it claims to be, and it surprised us how much we used the functions we initially thought were a little gimmicky. The lens has a 135-degree angle of view and up to 12x zoom with auto enhancement - the kind of features we missed out on when testing the BT Smart Home Cam 100. The Withings Home has eptz-technology that enables you to control pan, tilt and zoom in and out of the HD video feed, enabling you to see smaller details, as well as more of your room. Night vision is automatic based on conditions and happens as soon as the sun sets. The night light is really impressive too: not only can you to choose from an entire spectrum of colours, or select rainbow mode which alternates between the various colours, but the Withings Home will also play a lullaby (albeit only one unlike the Smart Baby Monitor) should you want. It's a nice touch, but one that could have perhaps been expanded by adding the ability to stream from your smartphone for example. During the day and evening, the Withings Home will keep a diary of the events that happen within its vicinity so, in theory, you shouldn't miss anything. When an event is detected, it snaps a photo or records a short video clip, which form a Home Diary that allows you to scroll back in time and view up to two days of history. It's a free service, which automatically makes it more appealing than the BT Smart Home Cam 100 as you don't have to pay a monthly subscription to view captured moments, or sign into the app to begin recording them in the first place. However, a little longer than two days would be good as it's not going to cater for a two-week holiday. Alongside the Home Diary, the Withings Home features a time-lapse recap function in the top right hand corner of the app, which enables you to see the past 12 hours in a short and snappy way. Clicking on the top left hand corner will take you to a range of options including live stream, photo album to see past events, air quality and monitoring settings. The air quality section is where the company uses its experience to set itself apart from the competition. When you first set up the Home, it will monitor your surroundings for 48 hours to establish the normal environment so it knows when there is a change in the future. An alert will appear if the air quality of the room your Home is situated in goes above a certain Parts Per Minute (ppm), which will happen when you cook or clean for example. 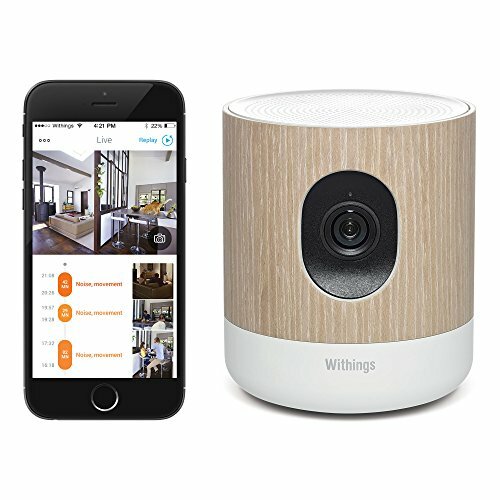 Withings claims the Home is the first video monitoring system to have this ability and while you may think it's unnecessary, it's an interesting addition and one that helps indicate how different activities affect the environment around you. Or when you should don a face mask. The notifications aspect of the Withings Home is where it falls down a little in because its monitoring settings don't offer as much control as the likes of the BT Smart Home Cam 100, for example. Withings allows you to choose whether you want push notifications, as well as decide on the events you want to be notified about. You can turn noise, sound and air quality on or off separately and it also allows you to determine the air quality threshold so you'll only be notified if it goes above the default 1,200ppm, or the number you have set it to. Withings considers 1,200ppm to be a medium air quality, while bad air quality is registered at 2,000ppm or above and good air quality is set at 1,000ppm and below. Air quality is the only threshold that can be determined though, which means noise monitoring and motion is all or nothing. The BT Smart Home Cam 100 caters for the sensitivity of movement for example, with smaller, medium, large and extra large options. It isn't too much of an issue but more control could be added here to make the Home more personal. It would also be good to see some form of scheduling introduced, along with an automatic detection of when you are at home so you don't receive notifications when you are one triggering them. Notifications can be shared via SMS, email, iCloud or social networks such as Facebook and Twitter, and they can also be deleted from the Home Diary if only noise or movement has been detected. You can't delete an event that detected noise and movement, which is good from a security point of view. The Withings Home is brilliant when you have a strong Wi-Fi or internet connection, but a weak one results in the live feed either not showing up at all or only every now and then. A weaker connection also means you won't be able to see the past events and instead you will be greeted with just grey boxes. We experienced some delay when it came to receiving notifications and the camera detecting noise, but it seemed to be fine with movement. There was around a second delay between the sound occurring in our living room and being shown in the app, but when we waved in front of the Withings Home, it picked every movement up instantly. Notifications on our iPhone came through a couple of seconds after we expected and at times we didn't get any when we thought we would. But as the Withings Home records events, we didn't feel like we missed any action. We discovered a slight issue with our Withings Home recording the cover as being closed every now and then, even though it wasn't, so we lost a couple of minutes of data during that time. We are sure nothing particularly exciting happened but it is an issue that could do with being ironed out. It is also worth mentioning that noise is still recorded even when the cover is shut as the microphone isn't turned off, and neither is the camera, so even if the action happening results in grey boxes, it can still be heard. Picture quality from the Withings Home isn't amazing, with the saved photo album images being quite pixilated. You can distinguish what is what, but the live feed is a lot clearer than the saved photos. Night vision is brilliant though, as you can actually distinguish objects during hours of darkness, making it far superior to the BT Smart Home Cam 100. Using the 12x zoom to its full capacity only digitally zooms, so quality is poor, as you would expect, but it's a useful feature to have. You won't be able to read finer detail, such as brand names on the dishwasher, for example, but you will be able to determine what small objects are. Using the Withings Home as a speaker via the app requires you to enter the live stream in full screen mode and press and hold the icon in the bottom left hand corner. It is simple, easy and it allows you to have a conversation with someone in your living room if you need to. A bit like Panic Room, or just a friendly chinwag. As the Home can transmit and receive data simultaneously it can be useful when delivering instructions to someone in the room. The Withings Home is a lot more than just a smart camera - it's the complete home solution it claims to be. It's a camera, a video recorder, a night light, a speaker, a one-song singer, a picture story teller and it will even tell you when you've burned the toast. You can't really ask for too much more that that. Like all things, it has its flaws - but they are outweighed considerably by its strengths. You might experience a slight delay with the detection of noise, notifications may not always come through exactly when you'd expect, and there's no motion/noise sensitivity controls too. Overall the Withings Home is a brilliant home monitor. The beautiful design, great app functionality, seamless live stream (with a good connection), quality night mode, plus good all-round performance make this the smart home camera to beat compared to the competitors we have seen.